The top 1 percent will receive 83 percent of all tax benefits in 2027. Over the weekend, President Donald Trump said the final Republican tax plan will offer “one of the great Christmas gifts” for the country’s middle class. But according to a new analysis released Monday, the bill really stuffs the stockings of the richest Americans—now and in the future. A report from the Tax Policy Center, a joint venture of the Brookings Institution and the Urban Institute, found that while Americans from all income levels will see an average reduction in taxes in 2018 and 2025, most benefits will go to wealthy Americans. 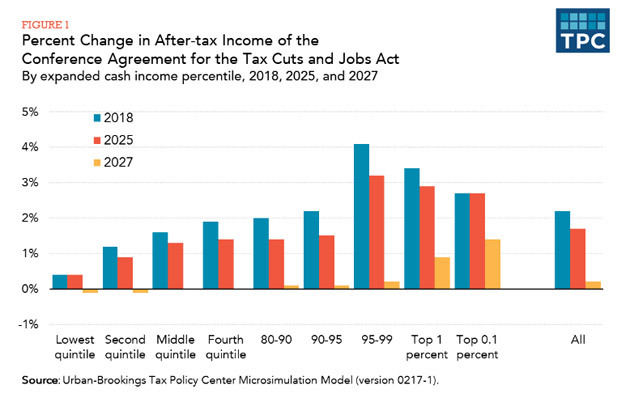 Households earning less than $25,000 would see an average tax cut of $60 in 2018, and middle-class households would see an average cut of $900; meanwhile, roughly two-thirds of the benefits will go to the top 20 percent of earners. In 2018, the top 1 percent of households would see an average tax cut of $51,000, a number that only grows over time. After 2025, the year when the individual tax provisions are set to expire, the average tax cuts for all go away. In 2027, households earning less than $28,000 would see an average tax increase of $30, while the top 1 percent of households would receive a $20,660 cut. On average, the top 0.1 percent would get a benefit of $148,260. In 2027, the majority of Americans will see a tax hike—and the top 1 percent of earners will receive 83 percent of all tax benefits. And remember the middle class? About 70 percent of households in the middle quintile of earners would see tax hikes, as opposed to 23 percent of those in the top 1 percent. The study, issued a day before lawmakers are set to start voting on the Republican tax plan, didn’t take into account the bill’s intention to repeal the Obamacare individual mandate, a move that the Congressional Budget Office expects will raise premiums and cause 13 million people to lose health insurance over the course of a decade.